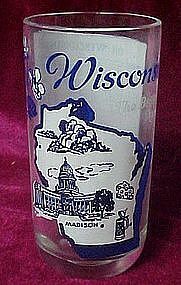 Vintage state souvenir glass of wisconsin, the Badger State. Picture of the state and a few attractions, and the state flower. On the back is a picture of sheet music with the song "On Wisconsin" & words.